supplying a gas pool heater at a price, discounted from the recommended retail price. Gas pool heating can quickly and efficiently heat your pool to a comfortable temperature for swimming at any time whenever it is required, regardless of the weather. The increased availability of natural gas and LGP has made it a popular form of swimming pool heating. The fact that it is always available and can be closely regulated makes it ideal for use on pools and spas where particular temperatures are required. Choose a gas pool heater that best suits your budget but also consider your lifestyle and the way you intend to use your pool and/or spa. Don’t overlook the possibility of obtaining some long term benefits from a short term cost. Gas pool heaters can be switched on and off at will, or operated by an automatic timing device, which are thermostatically controlled. If your pool needs to be used during the cooler months, just push the button the night before and your pool will be warmed up the next day* for that special occasion. For the more technically minded, click here to see the Fact Sheet on Gas Pool Heating from SPASA. *Conditions apply: This time depends on pool size, current and target water temperature, a gas heater's fuel energy input rating in Megajoules/hour (MJ/hr) and heat energy output rating in Kilowatts (kW). Contact us for gas pool heating system design for your requirement. In Autumn at affordable cost, gas pool heating with solar pool blankets heat up chilly pools fast, minimising heat loss caused by overnight wind derived evaporation, just as in Prince Albert Park Pool. At home you can enjoy a warm shower too, after you come out of your heated pool. On strong windy days water evaporates fast. 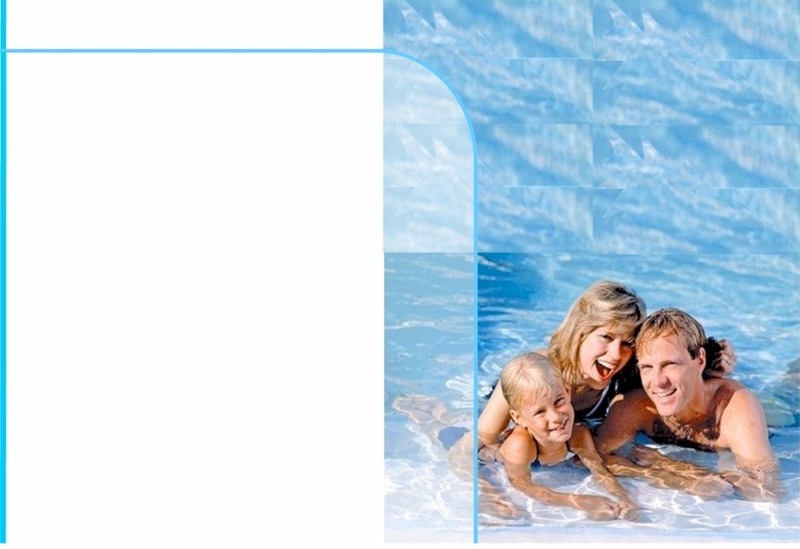 A drop of 1 cm in the water level by evaporation would result in sufficient heat loss to lower the pool temperature by just over 4 degrees C.
Contact Steve for a quick gas pool heater installation, service or repair. Sydney pool and spa heating, free quote for design, installation, servicing, upgrade and gas pool heater repair. 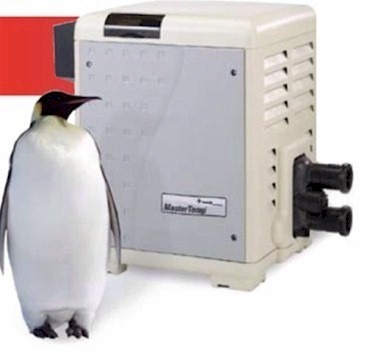 MasterTemp® gas pool heater is our special offering for reliable, energy efficient and fast pool and spa heating. Turbotemp™ gas pool heater is our latest offering for high performance, fast and efficient pool and spa heating. The pool is kept at 27° C, using a gas pool heater and is covered overnight to minimize heat loss. Click here to find out how to get there and to look up the opening hours. Open all-year round, including during Spring, Autumn and Winter, it provides fantastic views of the city skyline. The facilities include sky-lit change rooms, secure lockers, shaded areas, a landscaped sunbathing space and a café. A full list of other exciting facilities and activities are listed on the pool's home page. Find out what 100's of pool visitors say on Facebook. The pool is only a few minutes' walk away from Central Station when you exit at Devonshire Street and it is also easily accessible by buses and a light rail from all over Sydney. Here you'll find an interacting Google map, showing the exact location of the pool. The pool complex utilizes the latest filtration systems and incorporates the best in sustainable practices, including water-saving fixtures, stormwater harvesting and a green roof of native grasses to regulate temperature. Why not try to make a family outing to Prince Albert Park Pool on sunny days throughout the year and experience how pleasant it could be. See even in Winter the patronage there skyrocketing. Look up the weather forecast on the pool's home page. After having repeated swims in the heated pool, use a beach towel to dry up each time you emerge from the pool. The air temperature may feel much cooler unless you do this. Then your family can experience how pleasant it is frolicking or basking in the sun on cooler days or having a picnic either over the sunlit grass or over the shaded area under a beach umbrella. Secure lockers may be used to lock up some of your cloths or valuables. Sunbathers on the right are enjoying the warm sun. Don't forget to bring a beach towel or beach carpet if you want to sit or lie over the grass. If you have some time left over after your Prince Albert Park Pool outing you can explore other facilities in the park away from the pool's precinct. You may also consider walking over to the Powerhouse Museum via the Devonshire Street entrance of Central Station on Chalmers Street and follow the underground pedestrian crossing, the Devonshire Street tunnel leading towards it. In the tunnel, continue walking until you pass under Railway Square. Look out for the George Street exit sign, pointing towards an escalator on the left. Take this escalator up to George Street and walk in the same direction for about 100 metres until you reach Harris Street. Turn right and the Powerhouse Museum is at 500 Harris Street, about 5 to 10 minutes walk from George Street. Even during Winter, at affordable cost and even cheaper in Spring, Summer and Autumn, efficient gas pool heaters in combination with solar pool blankets can heat up your chilly pool fast, just like in the heated outdoor pool in Prince Albert Park. The solar pool blanket is needed to minimise pool heat loss caused by strong wind derived evaporation and overnight wintry near freezing air temperatures causing pool heat loss by radiation. This pool retains a huge amount of heat by the use of this pool cover when the pool is not in use. Without this pool cover, this huge amount of heat would not be retained and would need to be supplied additionally at extra cost to maintain the pool temperature at 27° C.
Pool water evaporation is one of the main factors in heat loss. A drop of 1 cm in the pool water level due to evaporation in our demo pool is equivalent to 300 litres of water evaporating. This would result in sufficient heat loss from the pool to lower the water temperature by just over 4 C° and additionally, an overnight near freezing ambient air temperature, would cause pool heat loss by radiation. Click the above hyperlink to see an example. A gas pool heater in combination with a solar pool blanket can fix this problem. The pool cover can prevent most of the water evaporation and cooling during colder weather when the pool is not in use. The gas pool heater can then raise to and keep the pool's temperature at 27° C with minimal outlay of energy in Winter and even less in Spring, Summer and Autumn. Having a heated outdoor pool could, for example, enable you to have on special occasions such as birthday or school holiday partying activities at your pool and its surroundings, weather permitting. 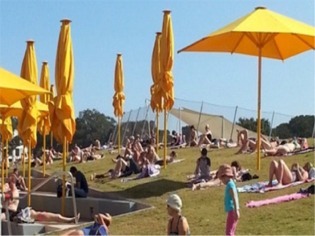 In such an event, you could guarantee chill free pool activities, just as in Prince Albert Park Pool. At home you can enjoy a warm shower too, after you come out of your heated pool and after drying up with a towel, you can avoid a chilly weather, when resting under the sun. Choose from our range of gas pool heaters. These include Raypak, HiNRG, Mastertemp, Viron and Turbotemp gas pool heaters. Having your pool heated every day may be too expensive for most households. You would only need to heat your pool ON DEMAND whenever you would want to use it, unlike the pool in Prince Albert Park that is heated to keep the temperature at 27° C all-year round. Contact Steve for a quick gas pool heater installation, service or repair in time for your impending special occasion period. and supplying a gas pool heater at a price, discounted from the recommended retail price. Thus the gas heater RUNNING COST is almost halved. 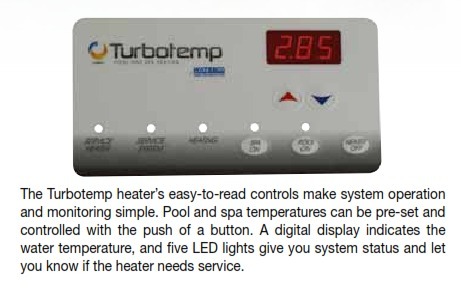 No matter what you're seeking in your swimming pool heater, the Turbotemp heater measures up. Compare this list of features to any other and you'll see why Turbotemp heaters are setting a new standard for total value. Engineered to super quiet operation. in a compact quiet and ECO-friendly design. 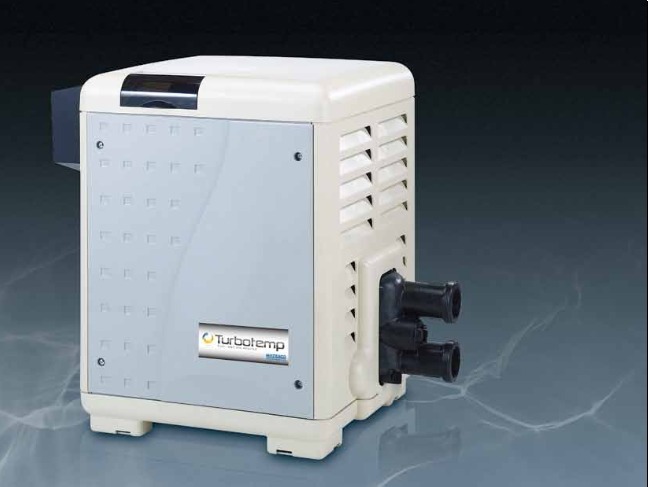 The Turbotemp heater's easy-to-read controls make system operation and monitoring simple. Pool and spa temperatures can be pre-set and controlled with the push of a button. A digital display indicates the water temperature, and five LED lights give you system status and let you know if the heater needs service. Safe operation is assured through a series of features including: a water pressure switch that senses the pump is running to prevent overheating; high limit switches assure the heater turns off if water temperature exceeds factory- set limits; manual gas shut-off when service is required; stack flue sensor also guards against overheating. A fully pre-mixed system with a highly efficient air and gas mixture lets MasterTemp heat up fast. See the MasterTemp brochure for more details. MasterTemp gas pool heaters are available with 200MJ/hr, 300MJ/hr and 400MJ/hr heating outputs and with a Standard Copper Heat Exchanger or with a Heavy-duty Cupro-Nickel Heat Exchanger that stands up to the harshest of applications, like low pH (i.e. acidic), high flow or heavy use. Frequently soaring energy prices have now become the main contributor to running costs for gas pool heating. The standard Mastertemp Copper Heat Exchanger is 84% efficient. As a high proportion of the heat generated by the burning gas to the circulating pool water is via the heat exchanger, Mastertemp uses less fuel than another gas heater with lower efficiency to raise the pool water temperature to a desired level. Thus Mastertemp heats up fast and contributes less to the gas heating running cost. To lower the running costs further, Sydney Pool & Spa Heating recommends that you install a Solar Pool Blanket together with your Mastertemp. This type of pool cover considerably eliminates pool water heat losses due to evaporation and radiation especially at night or at any time when the pool is not in use. The water circulating electric pump is also a substantial contributor to the running costs. In Sydney, the OFF-PEAK electricity rate can be set up at less than half the rate during PEAK periods. Therefore, we recommend that consideration be given to heating the pool water mainly during OFF-PEAK electricity periods, usually overnight if it is safe to do. Designing, supplying and installing a specific pool heating system is a complex interconnected or interwoven task that requires to be managed as a project. Not only has Sydney Pool & Spa Heating, a pool heating specialist just the right experience to manage such a project, but also we can supply gas pool heaters at a hot price, discounted from the recommended retail price and install the system, offering 7 years warranty on workmanship. One of the more popular heater in this range is the Premium 430 gas pool heater. Cupro-nickel heat exchanger for greater protection from corrosion. All bronze headers for greater temperature tolerance and corrosion protection. Stainless steel constructed base and combustion support structure. Powder coated "ZAM" heavy gauge metal casing to withstand the harshest operating conditions. Energy saving “hot surface ignition”. Australian manufacture and design excellence. Service code diagnostics and child-lock function. Suitable for use with natural gas or LPG. The heater allows you to operate two motorized valves (pool to spa changeover) and also has a pump run on timer, which protects the heater exchanger in the cool down mode. Raypak EIB controller option provides six auxiliary relays to operate: pool lighting, water features, garden lights, pathway lighting. The HiNRG Heater replaces our 20 year old MX series and comes in three sizes, 175, 250 and 400. The HiNRG has a smaller footprint than the Hurlcon MX and reduced clearances which makes it easier to locate and ﬁt in tight positions. All models are available in natural gas or LPG versions. New inlet outlet and return headers are self cooling and direct the water ﬂow through the heater so that ﬂow rates can be as low as 120 lpm or as high as 500 lpm – making HiNRG ideal for variable speed pump operation on low speed. HiNRG incorporates a conventional heat exchanger combined with a ﬁxed pre mix combustion system for high efficiency (83%) and reliable performance in almost any condition. The advantage of the pre mix combustion system is that as an outdoor model, the inbuilt variable speed fan ensures perfect combustion in any weather condition. The indoor conversion consists of a 125mm diameter ﬂue and vent cap which can be run for up to 16 metres horizontally or vertically. The smaller footprint and more efficient assembly means the HiNRG is around 10% lower cost than the MX. High efficiency Gas Heater with fixed premixed combustion in a compact footprint and low height. Modulating burner maintains accurate spa and pool temperature by turning down gas input when water temperature is within 1 degree of set point. Self-cooling headers and corrosion resistant copper nickel heat exchanger. Simple flue kit to convert from outdoor to indoor installations. Sophisticated Thermostat diagnoses heater status, hours of use and consumable parts usage. Easily adjustable feet enable simple levelling of heater on uneven installation pads. The Viron Gas Heater uses revolutionary technology to heat your pool quickly and accurately to the temperature you select. Heat on demand technology will save approximately 20% on operating costs over a conventional gas heater. By not having to run your gas heater all the time you will also reduce the C02 emissions produced. maintains a consistent and even temperature when pool is in use. The heat exchanger absorbs so much heat from the combustion process that the flue gases condensate. This condensation is then collected and can be returned to the swimming pool. of Using Gas Heaters with or without a solar pool blanket? The tables below show these monthly average costs* for maintaining the water temperature at 27º C for our centrally located Castle Hill swimming pool with characteristic features as indicated below. The tables below show the gas heating costs maintaining this water temperature with** and without blanket cover, the pool being exposed to the average monthly weather in the local area. As an example, if equipped with an appropriate pool cover, the average cost of maintaining the Castle Hill swimming pool at a water temperature of 27º C in October, using a gas pool heater would be $261 and without a pool cover $567. You can compare month by month or annually, the running costs of using a gas pool heater with or without a pool blanket. You can save more than 50% of the heating running cost by the installation of a solar pool blanket. On this modelling for the Castle Hill swimming pool, on average, about 63% of the heating running cost could be saved by using a gas pool heater in conjunction with a solar pool blanket during October and November 2011***. The tables below sets out this Castle Hill's pool water temperatures during June 2014 & July 2014. By a quick inspection of the tables below, you will see that pool water temperatures had been 10 to 15 °C all through June 2014 and 9 to 12 °C in the mornings of July 2014. Thus the pool was extremely chilly throughout June & July 2014. Installing a gas pool heater together with a solar pool blanket cover will then extend the use of your swimming pool into any day during Winter. And if you heat your pool ON DEMAND when you want to use it, the cost would be less than what otherwise it would have been without a solar pool blanket cover. Heating up your pool initially on such a day would cost a little less than heating it without a pool cover. Then if you cover your pool when it is not used, heating your pool on the next day would cost much less as the solar pool cover would have retained most of the heat generated in the first heat up. At present, unless blocked out by clouds, direct sunshine is mostly all over the pool from 10.00 AM - 4.00 PM. Sunday 1st 13/19 21°C 15°,15°,15° Cloudy. Winds N/NE 15 to 20 km/h. Monday 2nd 12/22 21°C 14°,15°,15° Mostly sunny PM. SE 20 to 30 km/h. Tuesday 3rd 7/20 21°C 14°,15°,15° Sunny. Winds SE->W 15 to 20 km/h. Wednesday 4th 7/22 21°C 14°,14°,15° Sunny AM. Partly cloudy. Winds S/SW 15 to 20 km/h->light. Thursday 5th 14/19 21°C 14°,14°,15° Cloudy. Light rain. Winds S/SW and light. Friday 6th 13/17 21°C 14°,14°,14° Cloudy. Winds S 20 to 30 km/h. Saturday 7th 9/19 21°C 14°,14°,14° Mostly sunny. Winds SW 15 to 20 km/h. Sunday 8th 8/18 20°C 13°,14°,14° Partly cloudy. Winds S/SW 20 to 30-> 30 to 45 km/h. Monday 9th 6/19 20°C 13°,13°,13° Sunny AM then cloudy. Rain. Winds S/SE 15 to 25 km/h. Tuesday 10th 9/17 19°C 13°,13°,13° Partly cloudy. Rain. Winds S/SW 15 to 25 km/h. Wednesday 11th 8/19 19°C 12°,13°,14° Partly cloudy. Winds SW 25 to 35 km/h->S/SE and light. Thursday 12th 9/19 19°C 12°,13°,14° Partly cloudy. Winds SW15 to 20 km/h. Friday 13th 8/21 20°C 12°,12°,13° Partly cloudy. Winds N/NW->N/NE 15 to 20 km/h. Saturday14th 12/20 19°C 12°,12°,13° Partly cloudy. AM rain. Winds W/NW 15 to 20 km/h. Sunday 15th 8/18 19°C 12°,12°,12° Mostly cloudy. Winds W/SW 20 to 30 km/h. Monday 16th 5/18 20°C 12°,12°,12° Sunny. Winds W/SW 15 to 25 km/h. Tuesday 17th 6/19 20°C 12°,12°,12° Sunny. Winds W/SW 20 to 30 km/h. Wednesday 18th 11/19 20°C 12°,12°,12° Mostly sunny. Winds SW->S 15 to 20 km/h. Thursday 19th 8/21 20°C 12°,12°,13° Mostly sunny. Winds W/SW 15 to 25 km/h. Friday 20th 9/21 20°C 12°,12°,13° Mostly sunny. Winds N/NW->W/NW 15 to 25 km/h. Saturday 21st 7/21 20°C 12°,12°,13° Mostly sunny. Winds W 25 to 35 km/h. Sunday 22nd 8/19 20°C 12°,12°,12° Mostly sunny. Winds NW 20 to 30 km/h. Monday 23rd 7/16 20°C 12°,12°,12° Cloudy. Winds N 25 to 35 km/h. Tuesday 24th 11/17 19°C 11°,11°,11° Mostly sunny. Winds SW 20 to 30->W 40 to 60 km/h. Wednesday 25th 6/18 19°C 11°,11°,11° Sunny. Winds W 35 to 50->40 to 60 km/h. Thursday 26th 6/22 19°C 10°,11°,11° Mostly sunny. Winds W/NW 25 to 30 km/h. Friday 27th 6/20 19°C 10°,11°,12° Partly cloudy. Winds N/NW 15 to 25 km/h. Saturday 28th 10/22 18°C 10°,11°,11° Partly cloudy↑PM. Winds N 30 to 45->W/NW 35 to 50 km/h. Sunday 29th 10/17 18°C 10°,10°,10° Mostly sunny. Winds SW 20 to 30->S 35 to 55 km/h. Monday 30th 5/16 19°C 10°,10°,10° Mostly sunny. Winds W/SW 20 to 30 km/h. Tuesday 1st 4/19 19°C 10°,10°,10° Sunny. Winds SW 10 to 20 km/h. Wednesday 2nd 5/19 19°C 9°,10°,10° Sunny. Winds W/SW 25 to 35->S 15 to 20 km/h. Friday 4th 3/18 19°C 9°,10°,10° Sunny. Winds W/NW 15 to 25 km/h. Saturday 5th 4/18 19°C 9°,10°,10° Sunny. Winds W 15 to 25->20 to 30 km/h. Sunday 6th 4/18 18°C 9°,10°,10° Mostly sunny. Winds S 15 to 25->W/SW 25 to 35 km/h. Monday 7th 4/18 18°C 9°,10°,10° Sunny. Winds W/SW 15 to 30 km/h. Tuesday 8th 4/19 18°C 9°,10°,10° Sunny. Winds SW->S/SE 15 to 20 km/h. Wednesday 9th 2/21 18°C 9°,10°,10° Sunny. Winds N/NW 20 to 25->25 to 35 km/h. Friday 11th 4/18 17°C 9°,9°,9° Sunny. Winds W 20 to 30 km/h. Saturday 12th 2/19 16°C 9°,9°,9° Sunny AM. Winds W/SW 20 to 35 km/h. Sunday 13th 6/16 16°C 9°,9°,9° Mostly sunny. Winds W/SW 15 to 25 km/h. Monday 14th 4/18 17°C 9°,9°,9° Partly cloudy. Winds SW->S 15 to 20 km/h. Tuesday 15th 9/16 16°C 9°,9°,9° Cloudy. Light winds-> N 15 to 20 km/h. Wednesday 16th 10/19 16°C 9°,9°,10° Sunny PM. AM light rain. Winds W 15 to 25 km/h. Thursday 17th 5/20 16°C 9°,10°,10° Partly cloudy. Winds W/NW 30 to 45 km/h. Friday 18th 5/16 17°C 9°,9°,10° Mostly sunny. Winds SW 35 to 55->25 to 40 km/h. Saturday 19th 6/16 17°C 9°,9°,9° Partly cloudy. Winds S/SW 30 to 45 km/h. Sunday 20th 7/16 17° 9°,9°,9° Partly cloudy. Winds S/SW 15 to 30 km/h. Monday 21st 6/18 17° 9°,10°,10° Cloudy. Light winds. Tuesday 22nd 7/19 16°C 9°,10°,10° Partly cloudy. Light winds->NW 15 to 20 km/h. Wednesday 23rd 6/19 16°C 10°,11°,12° Mostly sunny. Winds W 25 to 35 km/h. 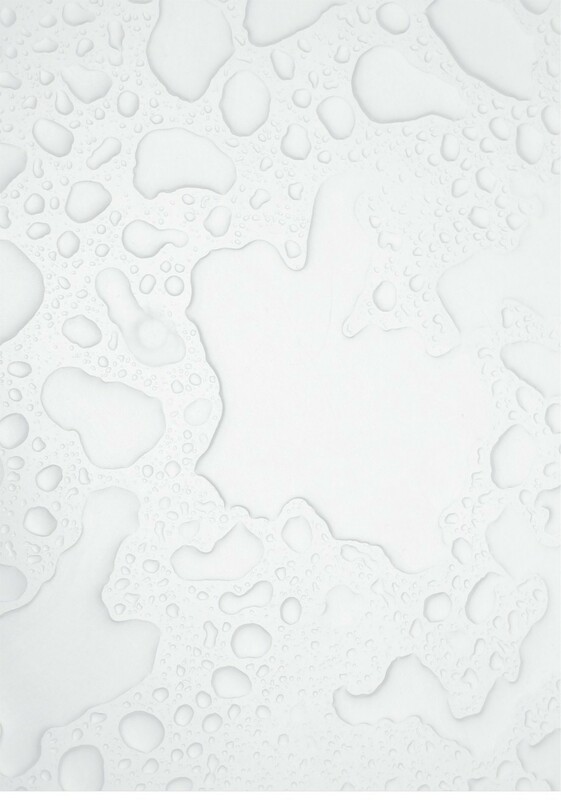 Thursday 24th 5/19 17°C 10°,11°,12° Mostly cloudy. Light winds->N/NW 20 to 30 km/h. Friday 25th 6/21 17°C 10°,11°,12° Partly cloudy. Winds W/SW 15 to 25 km/h. Saturday 26th 10/19 17°C 10°,11°,12° Partly cloudy. AM rain. Winds S/SW 15 to 30 km/h. Sunday 27th 5/20 17°C 11°,11°,12° Sunny. Winds SW 20 to 30->10 to 15 km/h. Monday 28th 6/19 16°C 12°,12°,13° Partly cloudy. Winds W 10 to 15 km/h. Tuesday 29th 10/23 17°C 10°,11°,12° Sunny. Winds SW 20 to 30->10 to 15 km/h. Wednesday 30th 10/23 17°C 10°,11°,12° Sunny. Winds W/NW 20 to 30 km/h. Thursday 31st 9/25 17°C 12°,12°,12° Sunny. Winds NW 25 to 40->35 to 50 km/h.